Tests performed by SP Technical Research Institute of Sweden for the Swedish Consumers’ Association and published in their consumer guide Råd & Rön. The lamps are tested in hanging position, uncovered. 3 lamps of each model are tested for light output, and 5 of each for durability. On-off periods are 2 hours 45 minutes on, 15 minutes off, 2:45 on, 0:15 off etc. For easy overview in English, I’ve transferred the most relevant data to my own tables. Black numbers are from the actual tests. Brown are my own, added for comparison and summary. The incandescent columns to the left shows the official recommended incandescent equivalent, and the single yellow column shows the difference in lumen (which is a measure of light quantity) between initial measured lumen of each energy saver from its incandescent equivalent to the left. • Light output: Average lumen/W similar to earlier years, but with big variations between models. Again the spiral group gave most light on average. Markedly lower output at -10 C, except 4 models. • Light loss: A mean of 15, 14 and 23 %, respectively, for each of the three groups after 5 000 hours. • Lamp life: Again, despite being marked between 6 000 and 15 000 hours, 8 of the 22 models tested had lost lamps by 5 000 hours! • Startup: Some improvement from earlier years but still not instant. The Sylvania ‘Mini-Lynx Compact Fast Start’ spiral was not among the fastest despite its name (71% after 30 seconds). IKEA’s spiral lamp had the quickest startup (90% light after 10 seconds). Bulb models were still markedly slower than stick and spiral models. • Light colour: Varying between incandescent-like and a bit colder. • Colour rendition: CRI 80-83, about the same as before., so the light quality has not improved over the last 25 years, despite the light itself appearing more incandescent in colour in the best lamps = still only ‘brass’ compared to ‘gold’. • Light output: In this group, only two of the ’60W equivalent’ retrofit CFLs even try to exceed 600 lumen! Only one 100W and one 150W bulb actually gives more light than its equivalent incandescent, and only in the beginning. For 9 of these 14 lamps, the difference was over 100 lumen, in one as much as 237 lumen! • Light output: Spiral CFLs gave the most light in this test, several actually ended up on plus compared with their incandescent equivalents (initially anyway). • Light loss: After 5 000 hours a mean of 14% . • Lamp life: Although these lamps were marked from 8 000 to 15 000 h, some had already gone out by 5 000 hours! As expected, this group did not do so well. Sticking a CFL in a frosted outer bulb a) probably offers a little better protection against UV-radiation and accidental breakage and b) makes the light less harsh on the eyes, but also c) filters out some of the light and d) makes the tube or spiral inside more vulnerable to overheating as CFLs are very sensitive to temperature. At least Megaman and Philips no longer try to pretend that all their 7 and 11 watt CFLs give as much light as a 40 or 60 watt incandescent. When I checked their online catalogues, they have actually started marking some as 35 and 50 watt equivalents, respectively – but again, only initially, of course. Getting a little bit closer to truth in advertising, but as there are no standard incandescent bulbs of those wattages, the consumer still gets less light than they originally had, unless they as a choose a higher wattage replacements than standard recommendations. • Light loss: After 5 000 hours a mean of 29%! • Lamp life: Again, although marked from 6 000 hours to 15 000 hours, 9 of these 24 models had already started losing lamps at 5 000 hours. • Light output: Lower performance at cold temperatures. • Startup: Some improvement in some lamps but most CFLs tested still struggled with light-up time, especially at colder temperatures. • Light colour: 2513 – 2870 Kelvin, which sounds acceptable enough. As of a couple of years ago, leading brands finally got their phosphor mix right so that the light now looks fairly incandescent (which was not the case earlier, and is still not true of every lamp on the market). 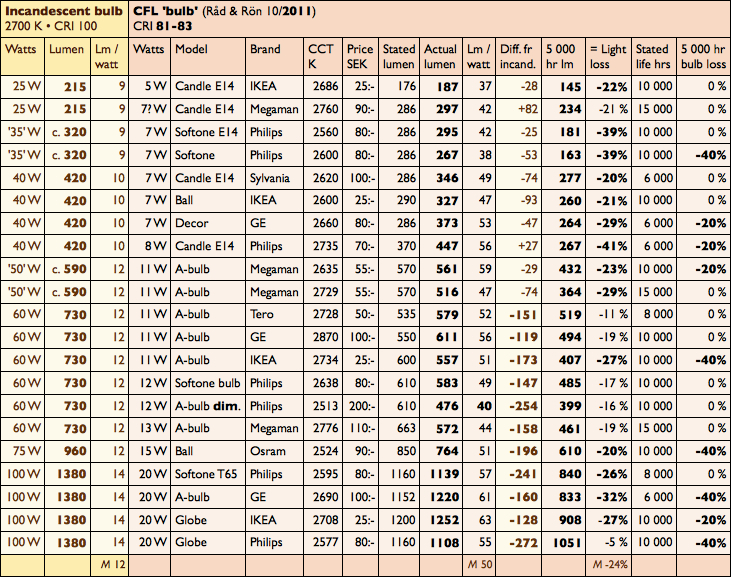 • Colour rendition: Stated and measured colour rendering index (CRI) still only 81-83 for standard CFLs. 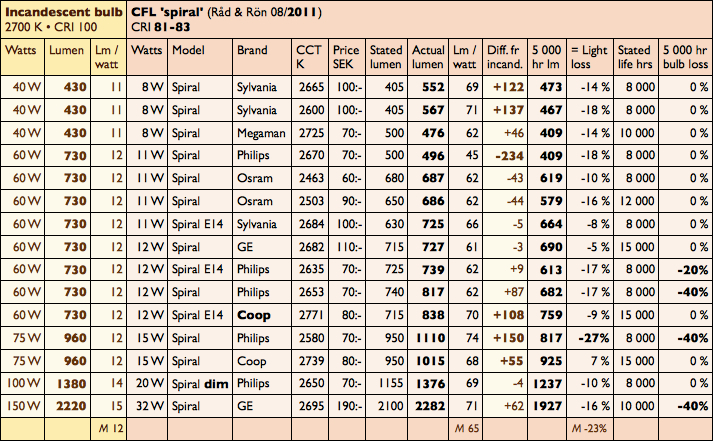 Råd & Rön test winner of all CFL lamps 2011 was surprisingly Swedish supermarket chain Coop’s ‘Änglamark’ spiral 12W. The 2010 test included three dimmable, but dimming behaviour was not tested. • Light output: The ‘spiral’ models generally did best when it comes to light quantity (lumen) per watt. • Light loss: A mean of 11, 10 and 18 %, respectively, for each of the three groups after 3 000 h.
• Lamp life: After only 3 000 hours (!) 20% and 100%, respectively, of Osram ‘Miniball’ models (marked 6 000 h) had gone out, and 20% of Philips ‘Tornado’ dimmable spiral (marked 8 000 h). The remaining weren’t tested for longer than that so we’ll never know if any of the longer life lamps lasted anywhere near their stated life, or how much light they had lost by then. • Startup: Very slow, especially at colder temperatures. This 2009 test I’ve included mainly because it is one of the few that tested lamps up to 8 000 hours. • Lamp life: Quite a few burned out long before stated life. 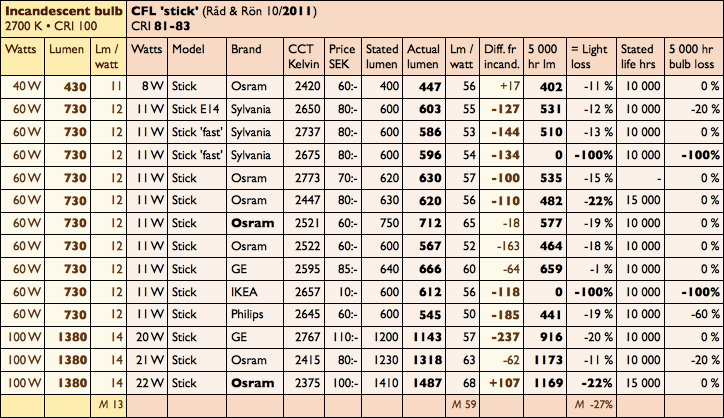 Of the Osram ‘Miniball’ 11W (marked 6 000 h), all had gone out by half that time! And of a less known brand, North Light (marked 10 000 h), 40 % had gone out by 6 000 hours. Bulb models were least durable while spiral models gave most light and lasted longest. One Osram spiral model (marked 6 000 h) lasted more than 8 000 hours.